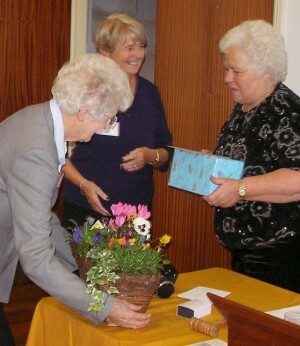 Blackwell & Burcot WI’s AGM in November marked the retirement of President Pearl Prior, who was presented with gifts by Jean Bromley and Ivy Elvins (pictured). In October, meanwhile, the group hosted a special meeting at Burcot Village Hall, with representation from the Catshill, Cofton Hackett, Bromsgrove, Sidemoor, Finstall, Dodford, Rubery, Frankley, Lickey and St Catherine’s branches. The women enjoyed a buffet and entertainment from comedian Dave Huband.